According to the Brain Injury Association of America, about 75% of TBIs are classified as mild. But that does not mean they don’t require assessment by a doctor. Studies of people who have had a concussion or other mild TBI have shown that even injuries that don’t cause loss of consciousness or do not appear to be serious can have long-term effects on the patients’ cognitive skills and may even cause personality changes and depression. In addition, a recent study found an association between even mild TBI and an increased risk of developing dementia. In the minutes and days after a mild brain injury, the brain cells that are not killed by the blow remain in a vulnerable state. This puts the cells at risk from minor changes in blood flow to the brain, increases in intracranial pressure, and decreases in oxygen delivered to the brain. For a period of time, the brain’s demand for glucose increases at the same time there is a decrease in the cerebral blood flow needed to deliver the glucose. This puts brain cells at increased risk of death. Moderate to severe brain injuries can cause swelling and bruising of the brain. This increases pressure in the brain, damaging brain tissue and constricting and/or damaging the blood vessels that supply the brain with oxygen and nutrients. Blood vessel damage can increase the risk of stroke and blood clots. More serious injuries can also cause internal bleeding. While there is no single prescribed treatment for minor TBI because of the widely varying symptoms, physicians usually treat the individual symptoms to improve the patient’s quality of life, for example recommending over-the-counter medications to ease headaches. 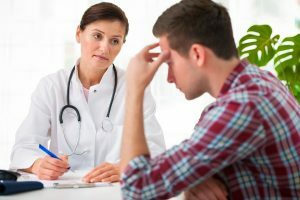 About 80% of people with mild TBI experience no more symptoms six months after the injury, while 90% reach full recovery by a year post-injury. After a mild TBI, your doctor will recommend physical rest, limiting certain activities to lower the risk of a second head injury, and limiting cognitive activities such as reading and watching TV to allow the brain to heal. People who experience more severe TBIs may require medications such as diuretics and anti-seizure drugs to lower the risk of secondary damage to the brain; surgery to remove blood clots, stop bleeding in the brain, and repair skull fractures; and rehabilitation. Always wear a seat belt or use an approved child safety seat. Wear a helmet approved by the American Society for Testing and Materials (ASTM) when riding a bike or motorcycle, roller or ice skating, using an ATV, skiing or snowboarding, horseback riding, engaging in contact sports, or batting and running bases in baseball and softball. Fall proof your home for small children and older family members by reducing tripping hazards, using safety gates on stairs, installing grab bars in the bathroom, and installing window guards to prevent children from falling out open windows. Keep all firearms unloaded and in a locked cabinet. Check water depth before diving.